tl;dr Shared files are accessible, but server isn't visible in Windows listing. I've got printers and some directories shared via Samba, but they do not appear in the listing when a Windows user opens their "Network". They can type "\computername\" and hit enter to see the shared printers and directories, but I'd like to make it easy to see the server listed along with other icons in their Network panel. This used to work (ubuntu 13-something, I think), but recently (ubuntu 15.04) it doesn't. So something must have changed with the default configuration. It's probably a simple setting in smb.conf, I just don't know where to look. Any hints? Now my samba shares show up in Windows 7/10. I know this is a Ubuntu forum but I am always willing to try to help fellow Linux users. I want to add this here, in case someone else comes looking. The issue with network discovery is the old way was tied to SMB1. The new way WS-Discovery, does not yet appear to be implemented in SAMBA. Windows does not yet support Zerconf so AVAHI does not work for Windows. 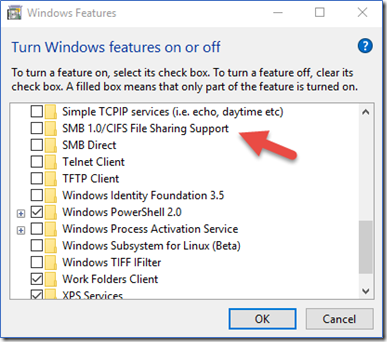 Falling back to SMB1 while disabling SMB2/3 is not the answer. And the article provides a link to a python script wsdd.py(https://github.com/christgau/wsdd/blob/master/src/wsdd.py), which provides the missing functionality. Running the script caused my SAMBA AD servers to instantly appear on Win 10 boxen. I've been hammering away at this problem for a few weeks, on and off, and it is only now that I have found the last piece of the puzzle for Windows 10 to see Samba shares in Network (places). Just hit START in Windows and search for 'Turn Windows features on or off' and it'll take you there. After I did this, all my problems vanished. Tada! I don't know if it has reduced the security of my network (probably has! ), but if it has it doesn't matter to me too much as it's all on LAN anyway. Hope this helps some other people out. Not the answer you're looking for? Browse other questions tagged windows samba or ask your own question. Samba: How do I make shared folders invisible from users with no permission?